Color is dark and inky, like black blood in a movie. The aromas are warm and earthy, with some tarry characteristics. This wine is on the hot side (meaning the alcohol content is high enough at 14.4% that I can feel it burn my nose a bit), and presents vanilla oak, sweet cherry, white pepper and mocha notes. There is an interesting, elusive whiff of aged cheese or truffle or really sticky skunk bud. On the palate, I get licorice, tobacco, and powerful blackberry jam flavors. The wine has a strong tannic grip, which makes it meaty and chewy-feeling, like it’s tight on my teeth and gums. The acidity is good, though, balancing out those structured tannins. The long, lingering finish is very reminiscent of dried blueberries. This wine is rich and delicious, very rewarding for $23 a bottle. Drink it with something equally rich: italian sausage, duck, or osso bucco. 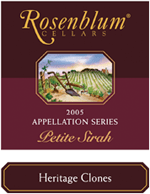 Rosenblum Cellars is a Zinfandel house, really, and Kent Rosenblum is known as a pioneer and an evangelist for the uniquely Californian grape. He’s a veterinarian who started as a wine enthusiast, started making wine at home, and eventually founded his own winery in 1978. No one was interested in Zinfandel or Syrah back then, but Kent persevered, and is now a legend. He still personally oversees the winemaking of all 30 wines that Rosenblum bottles these days, pulling from many old, small lot vineyards. The vines producing this Heritage Clones Petite Syrah are between 80 and 100 years old, according to the back of the bottle. 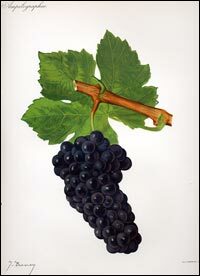 Petite Sirah is an interesting little grape: generally agreed to be an old cross of Syrah and a grape called Peloursin, it’s also called Durif, and is known for being pretty tannic and making deeply colored wine. When it rains on your Cabernet or Zinfandel harvest, you can blend in some Petite Sirah for added color and oomph. The “petite” part comes from the small grapes this vine produces, which explains the high tannin: tannin gets into the wine through the grape skins, so more skins on less juice means more tannin! Elementary, my dear. This tannic quality also makes Petite Sirah a good aging wine. What can be more challenging on a Petite Sirah is getting some fruit in there. It tends to be more peppery, more green/herbal, and more tannic, so taming that power with fruit tends the challenge for a winemaker. Alcohol levels also tend to be high. The wineries that have good success with this wine tend to be in hotter climates, in my experience. One of my favorite Petite Sirahs, especially for price-quality ratio, is from Bogle. (I like just about everything they do, in fact. Check their Chardonnay — yum for true!) The excellent wine blog Basic Juice reviews Bogle’s Petite Sirah here. Also, there’s a cute-ly named Petite Sirah “advocacy organization” called PS I Love You if you want to find more wineries in the US that vinify this interesting grape. Try it out! It sounds like an interesting opportunity to investigate how well “Pet” ages.